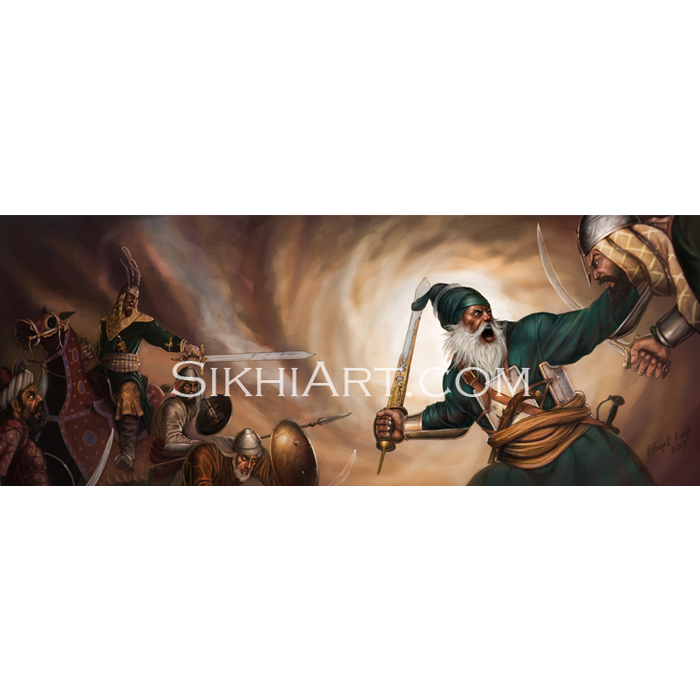 In this painting, Sant Jarnail Singh ji Bhindranwale defends against the attacks by the Indian army, who had brought in tanks in order to break through the fortifications put up by Sant Jarnail Singh ji. 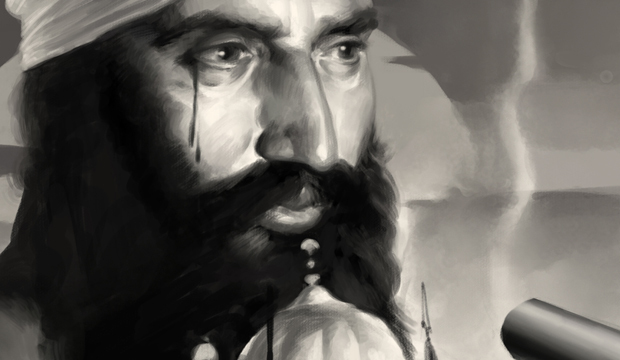 It was a tragic event that occured in June 1984, where many lost their lives, including the innocent pilgrims who had gathered at the temple to celebrate Guru Arjun Dev ji’s martyrdom. Sometimes called the Akal Boonga, the Akal Takht in Amritsar, Punjab, had been built opposite to the Harimandir Sahib to hold congregations. 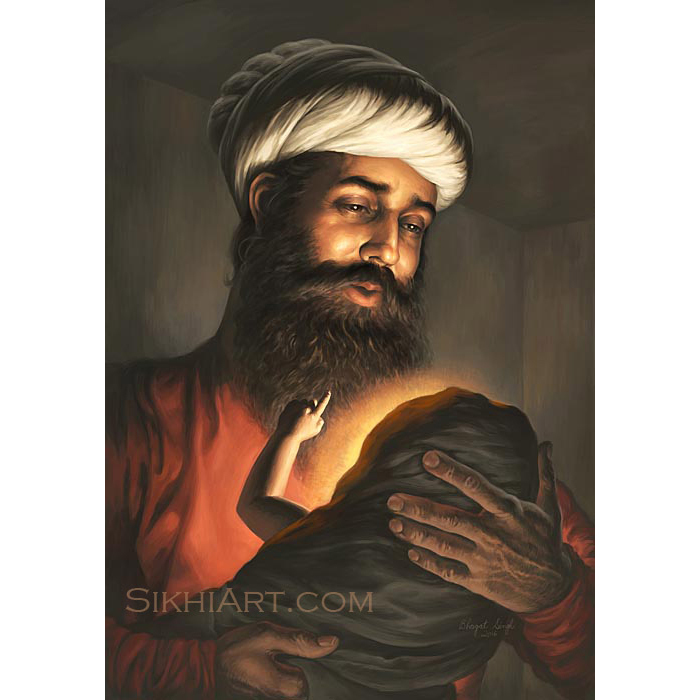 It had become the Sikh centre of authority during the times of the sixth Guru. 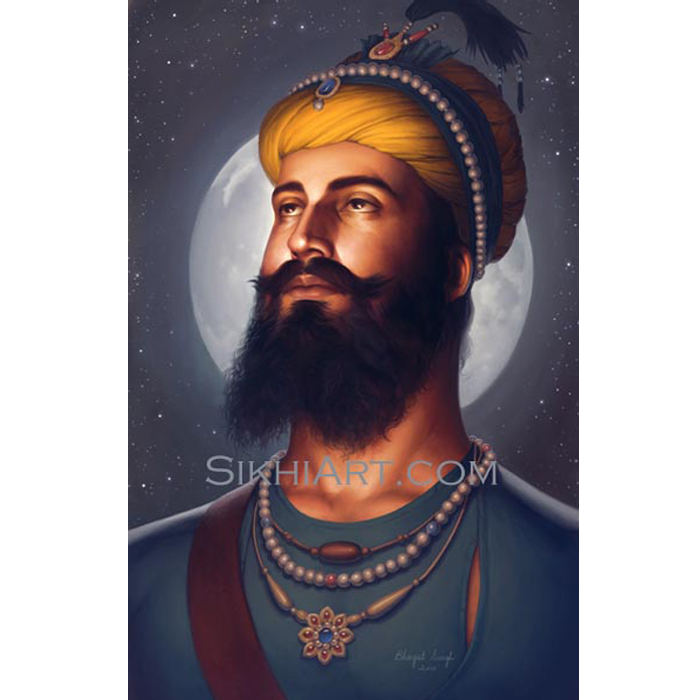 In those times, Akal Takht was a single-storey building that housed an eleven feet tall platform on which Guru Hari Gobind ji sat and held his court. 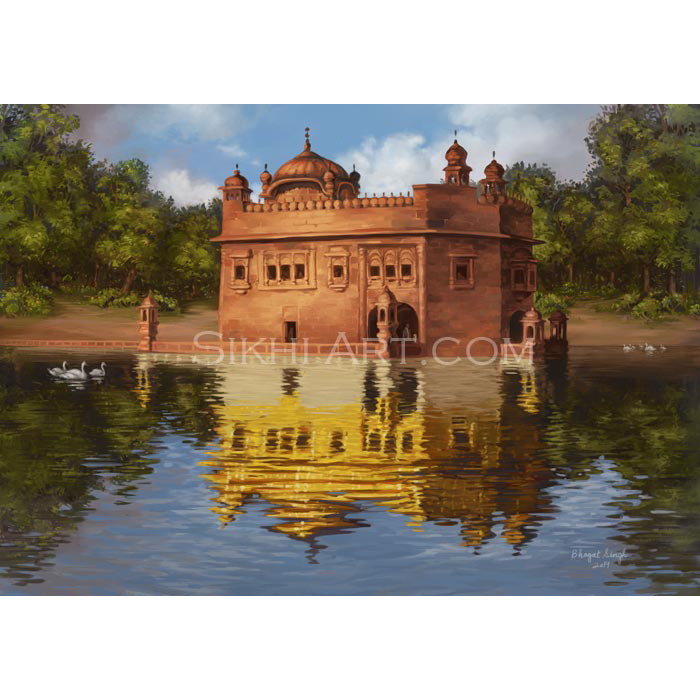 However centuries after, under Maharaja Ranjit Singh ji, this gathering place was made into a five story tall building in the style of Mughal architecture. 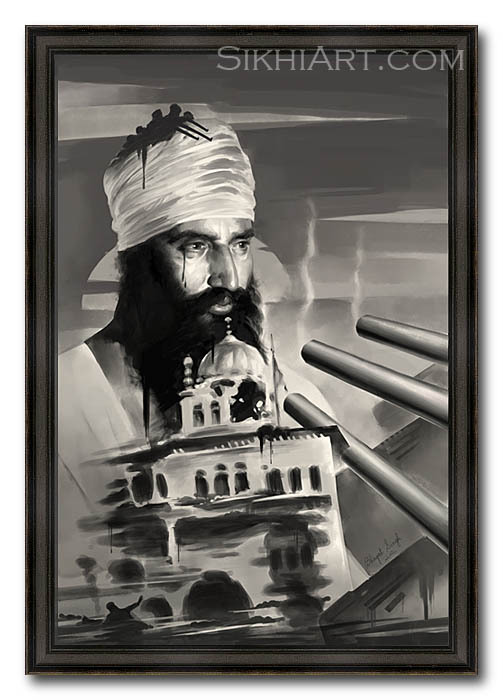 In 1984, Sant ji had fortified the Akal Takht and had made it his base of operations. 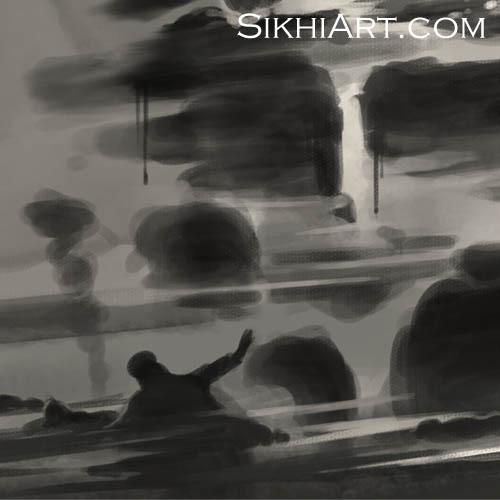 Feeling compelled to capture him, the Indian army attacked the Akal Takht. 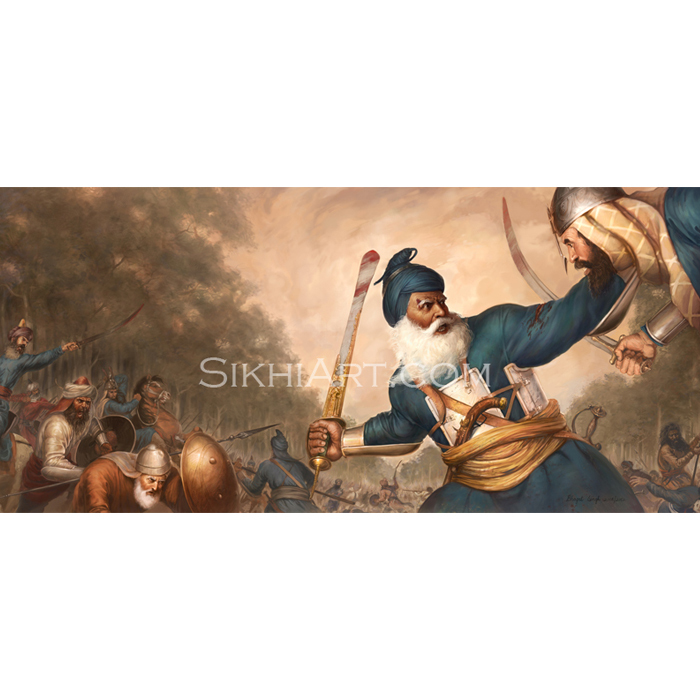 First with soldiers but when that failed they brought in a tank to blow the strong defence put up by Sant ji. 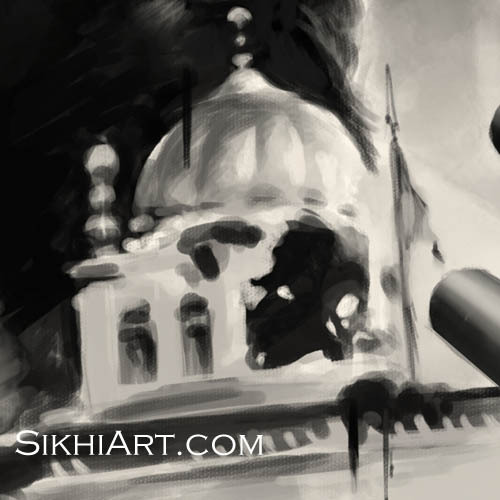 The heavy fire power brutally damaged the Akal Takht, which caught in the crossfire between the two sides. It had to be rebuilt due to the heavy damage. 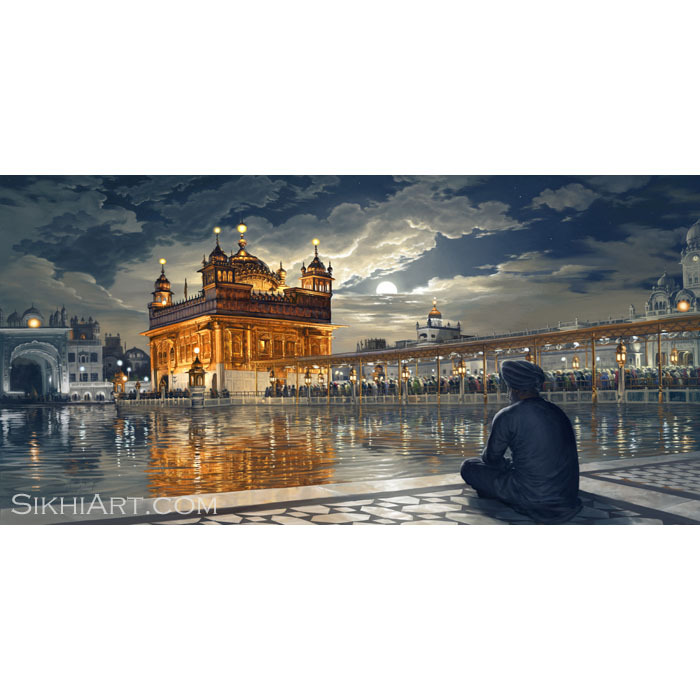 The Indian government rebuilt the Akal Takht however tension ensued and some Sikhs demolished the structure and rebuilt it again in 1986.
bhai saab dekhan nu sher di akh ch hanju lag riha ki eh????? 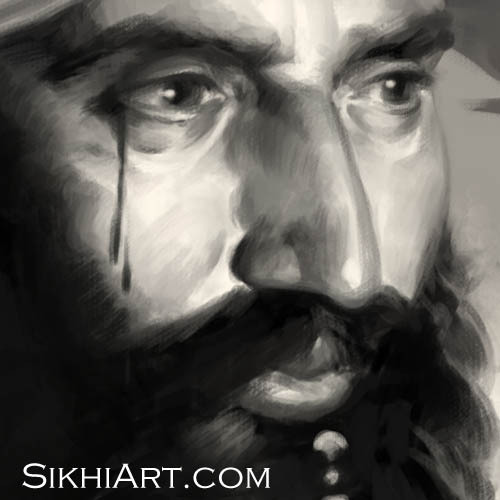 Veerji, Bhai saahb ne sant ji di akh ch hanju nahi Khoon dikhaya hai.. jo k kise androoni ghaav cho risda jaap reha hai..
Te maen tuhadi gall naal poori tarah sahmat Haan.. Bhai Saahab nu waheguru ne bahut avalla hunar baksheya hai, jisde sadke bahut ghatt waqt ch bahut ziada shohrat v ditti hai. 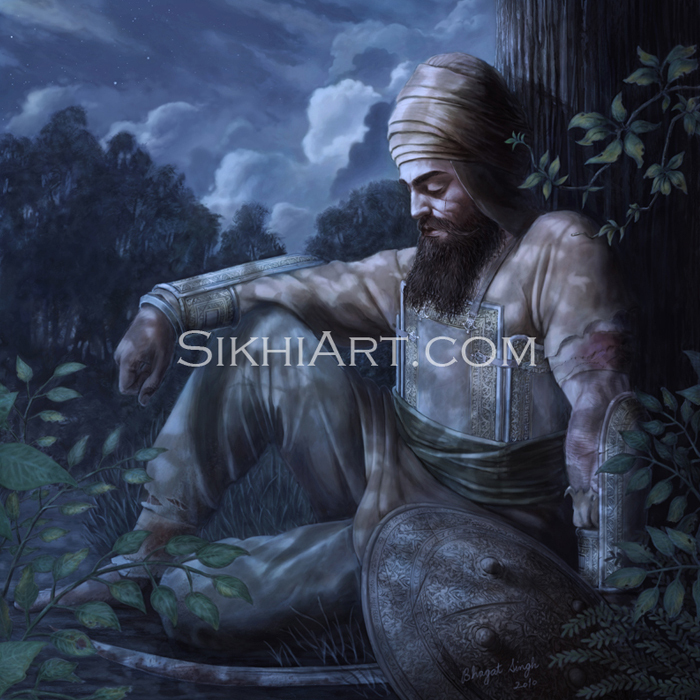 Je bhai sahab Es kala nu vechan’ge taan eh seva nahi kahaayegi..
Bhai sahab, vaise taan sikhi vich tasveeraan di v koi jagah nahi.. par ajoke yug vich aap diya tasveeraan Guru naal jorhan da kamm kar rahiya han.. pehlaan Guru naal jurhaange taan hi Guru de sandesh naal jurheya ja sakda hai..
Bahut sariya photos de wadde frames buy karan nu dil karda hai par $2500 keemat dekh k mutthi ghuttni pai jandi hai.. Since when did Bhindranwale became Sant ????? 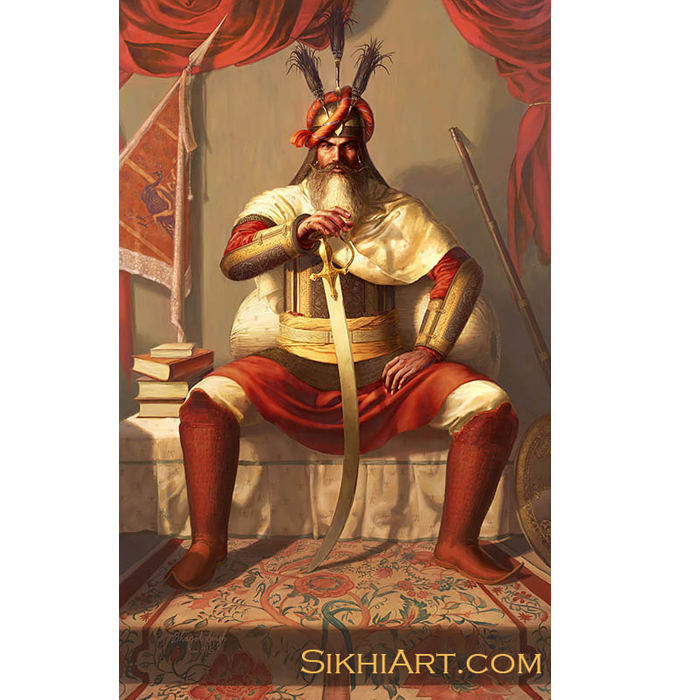 Sant Ji was a mahapurkh without their presence Sikhs wouldn’t have survived 84. 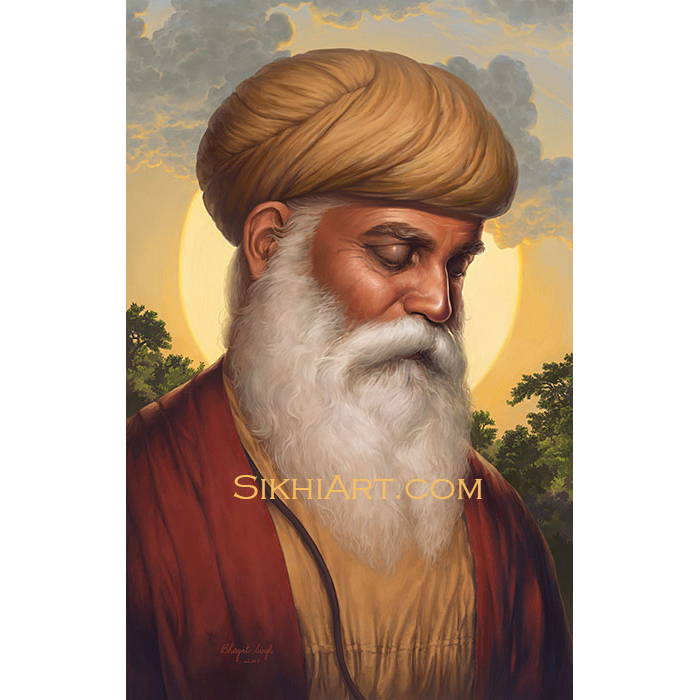 He fancied himself as a politician, knew little on Gurmat, Gurus or God. What have you ever done ? What have u ever done ? What did u ever do ?